This thesis focuses on the immunological phenotype, the mutation analysis, and the residual activity of mutated proteins in patients with PID of the lymphoid system. During this project, we have investigated possible genotype-(immuno)phenotype relationships in patients with antibody deficiencies and SCID. Consequently, mutation analysis of the relevant genes formed an essential part of the study. Part 2 focuses on the laboratory diagnosis of patients with PID of the lymphoid system. In combination with clinical data. detailed immunophenotyping of PB and BM appeared to be essential to select possible candidate genes for mutation analysis (Chapter 2). Chapter 3 describes the pre-analytical. analytical, and post-analytical phases of mutation analysis and comments on the pitfalls that might occur when trying to establish a molecular diagnosis. 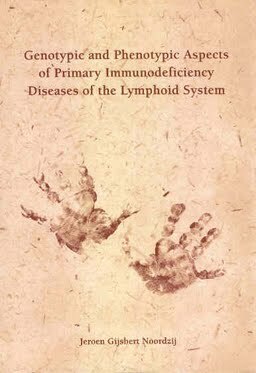 Part 3 focuses on antibody deficiencies, with primary forms of agammaglobulinemia as the main topic (Chapters 6, 7 and 8). As agammaglobulinemia can result from an arrest in precursor B-ee!! differentiation in the BM. we have used detailed immunophenotyping of BM samples for assessment of the precise differentiation arrest. for identifying possible target genes, and for studying possible genotype-immunophenotype relationships. Part 4 focuses on SCID, especially patients suffering from T-B-NK+ SCID or OS caused by mutations in the RAG genes (Chapters II and 12). Whenever available, the BM samples of these B- SCID patients were subjected to detailed immunophenotyping. Furthermore, we tried to unravel the residual recombination activity of mutated RAG proteins via several approaches. In addition to in vitro analyses with RAG gene transfection and subsequent recombination of a plasmid recombination substrate as read-out system. we used Ig gene rearrangement patterns in BM samples as an in vivo read-out system of RAG protein function. Finally, Part 5 describes two patients with mycobacterial infections due to mutations in the gene encoding the interferon gamma receptor I chain (IFNGRJ). Although both patients suffered from complete signaling defects from the IFN-yR, one patient died at young age while the other patient is still alive without BM transplantation, showing the variability in clinical phenotypes in patients suffering from complete IFN-γR signaling defects.